My mom taught me many valuable things (such as standing up for myself, which helped save me from a would-be child molester). One of the the particularly useful skills she taught me when I was a child was self-hypnosis. It may sound like I'm about to veer into Derek Flint territory, but there isn't anything particularly weird or mysterious about simple self-hypnosis, at least not the method I use. Lie down or sit comfortably. Begin concentrating on your toes. Think about them. Then imagine them falling asleep. almost as if they are disconnecting from the rest of your body. Once you are done with your toes, move on to your feet, your legs, etc. That's it. Often, you are either deeply relaxed or asleep before you ever make it to your face and head. I've found self-hypnosis particularly useful on nights I couldn't get to sleep and on long airplane trips. Where did my mom pick up this offbeat skill? I don't really know. She was an accomplished nurse, and accumulated all sorts of medical knowledge over the years. Self-hypnosis was probably just one of those things she picked up. Zen breathing is sort of a cousin of self-hypnosis. It's also a rather fancy way of simply referring to the practice counting your breaths. I was introduced to the concept in the works of Robert Aitken. 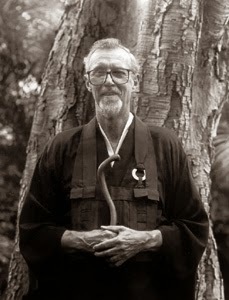 Aitken (1917 - 2010) was the master of the Diamond Sangha, a Zen Buddhist society he founded in Honolulu in 1959. He advocated the counting of breaths to people who were new to sesshin, or intense Zen meditation.